P13 Send Cyclamen Plants. Buy Cyclamen Plants for all occasions. Long Display of colours indoors. Let the cyclamen flowers makes someone feel you care. Send these classic indoor colours now! 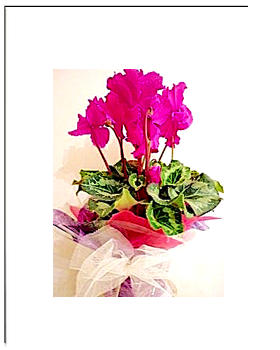 Small – As Pictured Cyclamen Plant in Gift Box. Medium – Cyclamen delivered In ceramic Pot. Impressive 4 clusters of cyclamen plants in large glass bowl and all sides covered by moss. Cyclamen Plants. Like cold air to bloom further and watering in warmer months. They have variegated foliage and unique flowers that turned downwards. Enjoy looking after this plant!